Looks crispy and yummy,adding oats adds to the goodness. 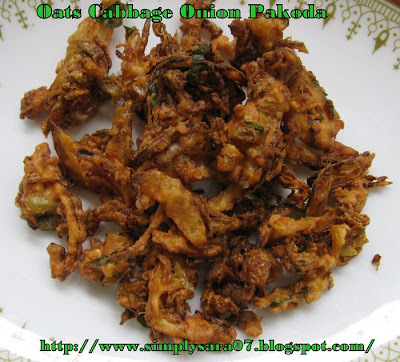 Crispy pakodas looks sooo inviting..awesome! all time favorite pakodas and a healthy twist..oats..sounds yummy..looks superb..
Pakodas are all time fav..Loved the idea of adding oats in it. Must be very tasty and crispy. That is a wonderful addition to add oats to pakodas. Everyone is right: they look perfect! I'd love to try this with my favourite - eggplant. Mmm-mm!